Team pages for the Autism Speaks Walks are pretty standard fare. You can go to each page to learn a little bit about a team who is pledging to raise money and donate to them yourself. A quick search of participants shows a wide variety of folks including companies, families, and organizations, which made the “Soldiers of Odin Canada – Ontario South Division“ not particularly unique outside of the comparatively large roster (most team pages are for about 2 people, Soldiers’ page has 10). That is of course, unless you know who the Soldiers of Odin are. At first glance, one might assume they’re just a biker group. Both the name and their team picture, featuring a number of guy all wearing leathers and jean vests, suggest as much. Being a biker group is fine. Bikers have been making the headlines for the past few years about their commitment to protecting kids and stopping child abuse. Sometimes great things come in stereotypically “threatening” packages. A quick search of Soldiers of Odin reveals that they are dedicated neighborhood watch and patrol, a relatively innocuous title for groups of citizens that serve within their community. However, Soldiers of Odin , isn’t just a one off name chosen out of hat based on what sound coolest. It is an “organization” of sorts with many chapters in various countries (including the USA) that has traces its roots all the way back to Finland, and more specifically : Mika Ranta. Dubbed by multiple media outlets as white supremacists, the founder starkly denies being racist or neo-Nazis, but it does not stop them from using this motivation to appeal to those who are. It should be noted that Ranta does maintain ties with the Finnish Resistance Movement, which was birthed by White Aryans and the Swedish Resistance movement and has a criminal conviction for the racially motivated murder of Jim Kartunnen, an anti-racist activist. The Anti-Defamation League was so alarmed by the rapid growth of SO over the past few years that it issued a special report. Initially, Soldiers of Odin only had footing in Europe, but given the panic over refugees and general political climate, Canada and the US have become home to their own chapters and privy to the fruits of their labor. A disturbing video of a group “patrol” in Denver, a city with a surprisingly high Muslim population are some of those fruits. The members of the US groups include such members as Jacob Laskey, who was convicted of a federal hate crime in 2006 for an attack on synagogue in Oregon. 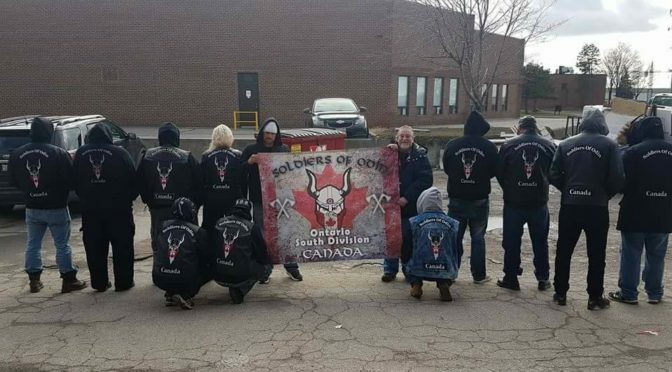 This is the Soldiers of Odin are who “proudly” supports Autism Speaks and, for clarity’s sakes, are definitely not a biker gang. Autism Speaks employed a consistent script of “Thank you for your post. We take your comment very seriously and [are] looking into it.” However, Emily Paige Ballou, a leader in the Autism Women’s Network, voiced some of the same questions most of us have. “Googled this in a couple of seconds. How long does it take you to look into it?” (emphasis added). The page was taken down this morning around 10 AM, but it was still up for almost 5 days. 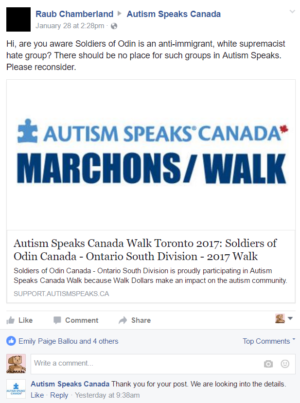 It is unclear if the Soldiers of Odin are still marching in the Speaks Walk or if the page has merely been taken down — Autism Speaks has not responded to any inquiries so far. Autism Speaks Canada has taken to responding to EVERY comment with a cut and paste canned reply, including a statement about how they operate “with love”. … not an ounce of sincerity. Personally, if I were working for an organization with ties to a nazi group, I’d be doing my best to respond in the most professional and SINCERE manner possible. … but then again, I don’t work for an organization that not only has those ties to a nazi group, but itself advocates for eugenics, themselves. I suppose that situation would cause a grey area…?